The Spiritual Life/Worship Committee oversees, recommends, and evaluates the ongoing liturgical and sacramental life of the parish. Thus through the Committee, all the liturgical ministries are coordinated. The Committee meets regularly to evaluate the quality of liturgical celebrations and to recommend ways of improving the quality. 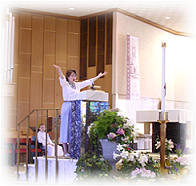 It also implements programs of in-service and training for liturgical ministers. An important dimension of the Committee’s activity is prayer and the opportunity to grow in knowledge and understanding of the Church’s liturgical mission.